​​​​​ ​​​DALLAS – The Luminary, the new tallest building in downtown’s West End district, has topped out construction. 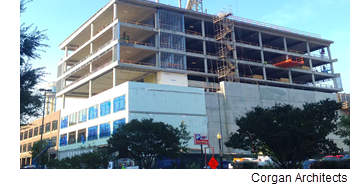 The seven-story, 105,000-sf building, located on Houston St., is being built by developer Crescent Real Estate and its partner Long Wharf Capital. The project is going up next door to architect Corgan's longtime headquarters.